Make some time in your life to visit the stunning Taj Mahal. 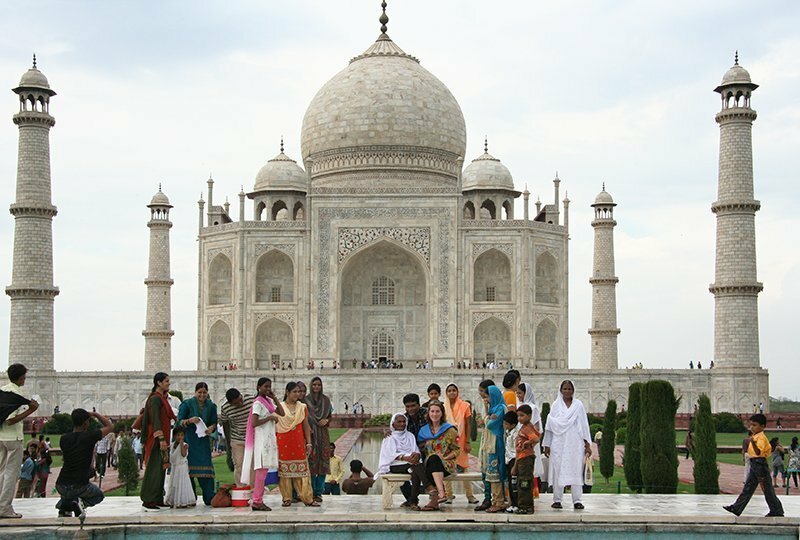 It is one of those must-see, must-do, not-to-be-missed sites that is almost mandatory for any visit to India. And it’s worth every moment spent there. The wonderful Taj Mahal was built by Shah Jahan who was so devoted to his favourite wife, Mumtaz Mahal (Jewel of the Palace), that he could not bear to be parted from her. He insisted that she accompany him everywhere, no matter what her state of health. While travelling with him on a military campaign, she died at the age of 39 giving birth to their 14th child. On her deathbed she asked the Emperor to show the world how much they loved one another. He neglected his affairs of state, concentrating on the construction of a magnificent memorial to her. The Taj-i-Mahal (the Crown of the Palace) was started in 1632, taking 22,000 workers 22 years to complete. It core was made of red sandstone available locally and lined with marble from Makrama in Rajasthan that was transported 300Km by a fleet of 1,000 elephants. The mausoleum was adorned by semi precious stones that came from far and wide: red carmelian from Baghdad, Red, yellow and brown jasper from Punjab, green jade and crystal from China, blue lapis lazuli from Ceylon and Afghanistan, turquoise from Tibet, chyrsulite from Egypt, amethyst from Persia, Agates from Yemen, green Malachite from Russia, diamonds from India and mother of pearl from the Indian Ocean. Nothing prepares you for the first sight of the real thing. The gleaming white marble pierces the blue sky in a vivid picturesque scene that assaults the eyes and immediately heightens all senses. 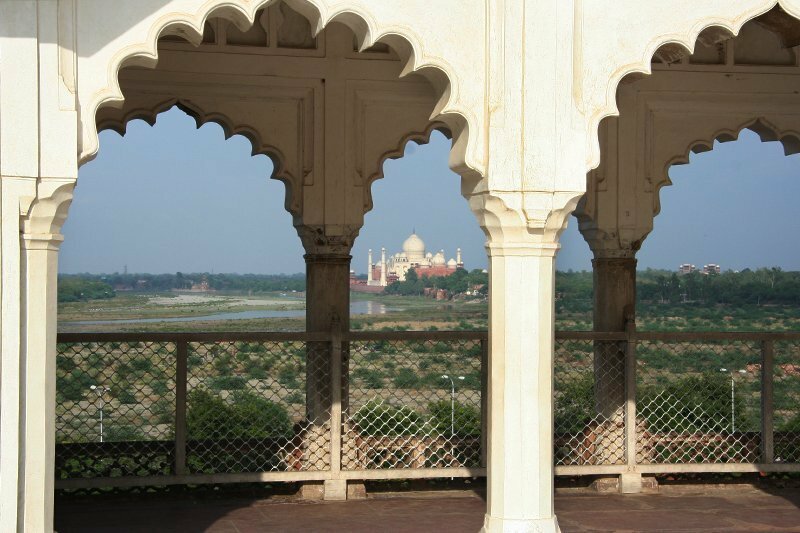 The mausoleum stands on a raised marble platform, set within ornamental gardens and at the end of a long, narrow pool of water, the stillness of which reflects the Taj perfectly. Four slender minarets guard each corner of the platform, leaning slightly away from the mausoleum so that, in the event of an earthquake, they would not harm the most precious building. 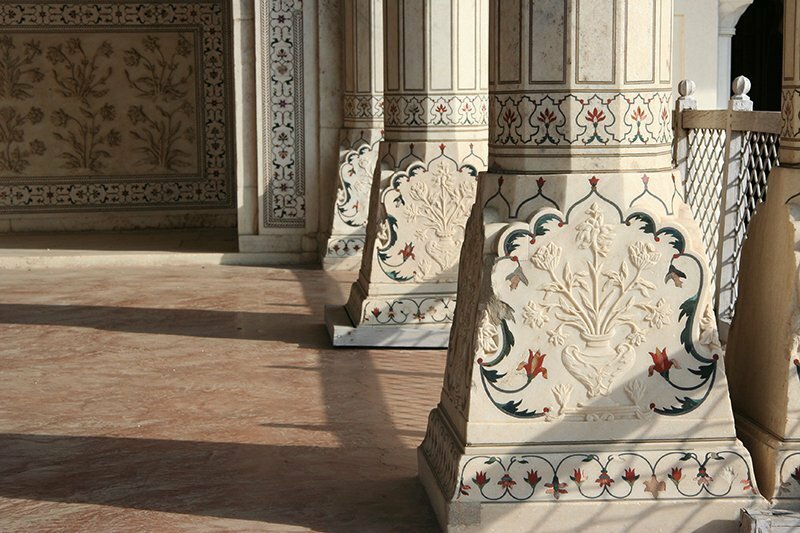 The mausoleum is made from semi-translucent white marble, carved with flowers and inlaid with semi precious stone. The whole wonderful structure is crowned by four small domes surrounding a bulbous centre on which stands a 17 metre golden spire. 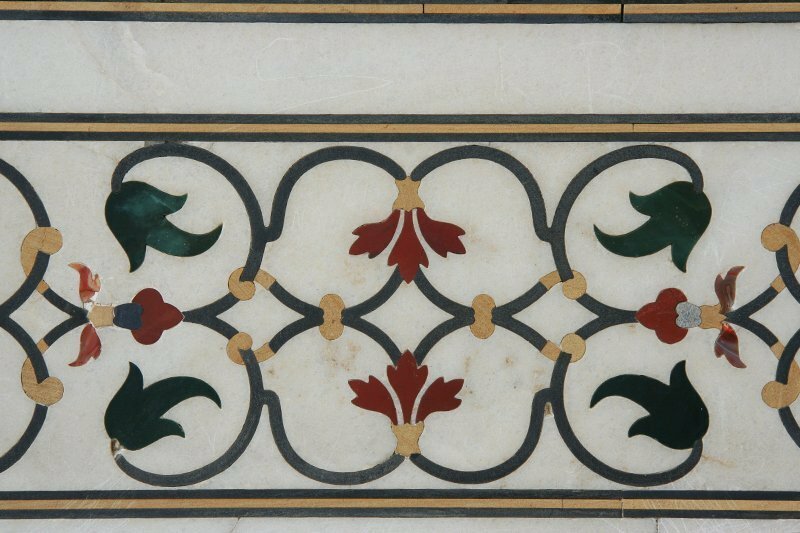 In the unique beauty of the Taj, subtlety is blended with grandeur and a massive overall design is matched with immaculately intricate execution. 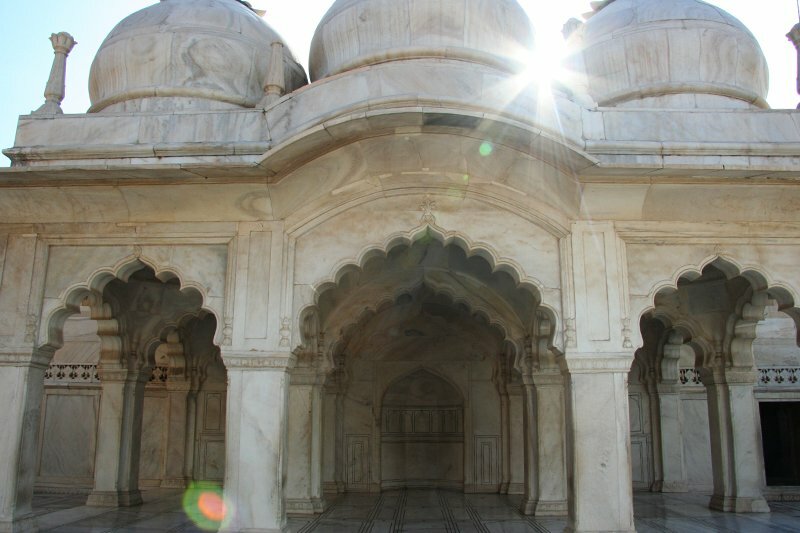 The white marble is extraordinarily luminescent and, during any one visit it is possible for the whole building to seemingly change its hue according to the light in the sky. The building has a mesmerising power.